AleaSoft, April 15, 2019. 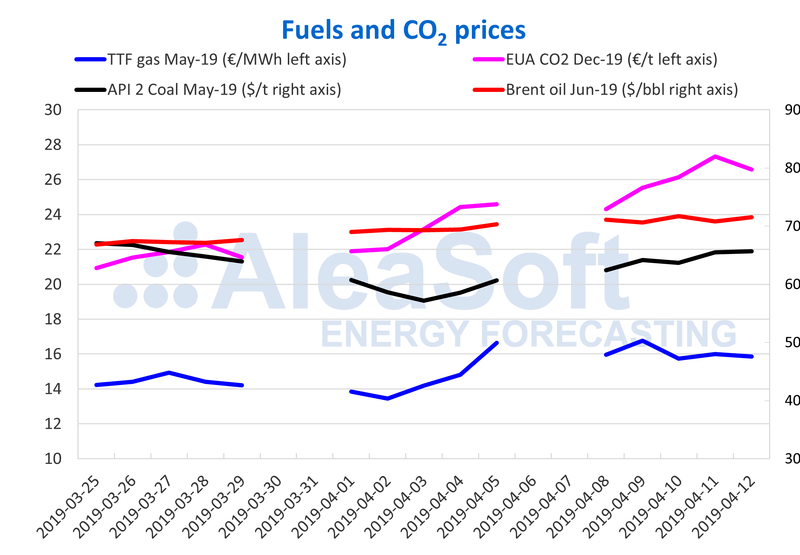 AleaSoft analyses the prices of the fuels, CO2 emission rights and electricity markets, which in the last week continued to rise. The rise of CO2 emissions prices broke all records. Brent oil futures prices continue the upward trend for June 2019 in the ICE market settling on Friday, April 12, at 71.55 $/bbl. On Wednesday, March 10, it reached 71.73 $/bbl, values that were not seen since November 9 last year. During the week, the systematic bullish price trend that started on December 24 continued and seems that it can reach 75 $/bbl. In the second week of April, the futures of TTF gas in the ICE market for May settled on Friday, April 12, with a drop down to 15.85 €/MWh after reaching on Friday, April 5, 16.63 €/MWh. The winter that just ended was characterized by temperatures above the average and electricity consumption lower than expected. This situation caused the gas needs in Europe to be lower than planned and that excess gas has led to the price decline observed since October, breaking the barrier of 14 €/MWh, on April 1. As we stated at AleaSoft in other occasions, a constant eye must be kept on the events in Algeria where part of the gas consumed in Western Europe comes from. Like gas prices, API 2 coal futures prices for the month of May in the ICE market had a recovery in the first days of April after breaking a low record, compared to the prices of the last two years. Unlike gas, API 2 prices continued to recover in the second week of April, reaching 65.70 $/t at the end of Friday, April 12. As in the case of gas, the high temperatures of the European winter caused less coal to be consumed. The upward trend of the first two weeks of April does not seem to last for too long because of the little demand for coal consumption, especially now that the prices of CO2 emissions raised and the electricity demand decreased in the spring, especially in Easter. In the electricity sector, the most relevant news of the year in Europe was the rise in the price of CO2 emission rights futures for the reference contract of December 2019 in the EEX market, which reached on Thursday, April 11, 27.32 €/t. From 21.90 €/t on April 1, the increase was 25%. Among the causes there is the extension of the Brexit until October, since the United Kingdom is a large consumer of CO2 emission rights and also a part of these contracts have a speculative manipulation. We believe that these prices should fall to the range of 20-25 €/t in the coming days. Sources: Prepared by AleaSoft using data from ICE and EEX. In the second week of April, prices in Europe continued to rise, similar to the previous week, by more than 6% in general average, mainly due to the increase in CO2 prices. That was despite the fact that temperatures rose and demands decreased in the main markets of Europe. We continue to observe two groups of well-differentiated market prices. In the group with the highest prices there are the N2EX market in Great Britain, the Italian IPEX market and the MIBEL market in Spain and Portugal. This group closed the second week of the month with prices around 55 €/MWh. In the case of the Italian market, it was several days above 60 €/MWh. With the lowest prices there are the Nord Pool market of the Nordic countries and the EPEX SPOT markets of Belgium, the Netherlands, France and Germany with average prices in the week of 43 €/MWh. Prices continue to be similar in all these markets since the beginning of the month. 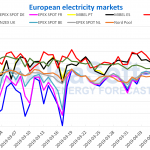 In the European electricity futures markets, the last week of April 8 the price for May 2019 continued to rise for most markets, following the increase in the price of fuels and CO2. In general, from Friday, April 5 to Friday, April 12, the increase was between 2% and 8%, with the exception of UK futures in the ICE market, which fell by 2.9% in the analysed period. In the second week of April, wind energy production was uneven in the main European markets. In Germany, the main producer, wind energy production rose by 5.8% compared to the previous week, in Italy it rose by 10% and in France it just rose by 0.9%. Wind energy production fell by 6.3% in the Iberian Peninsula, mainly due to the drop in Portugal of 24%. 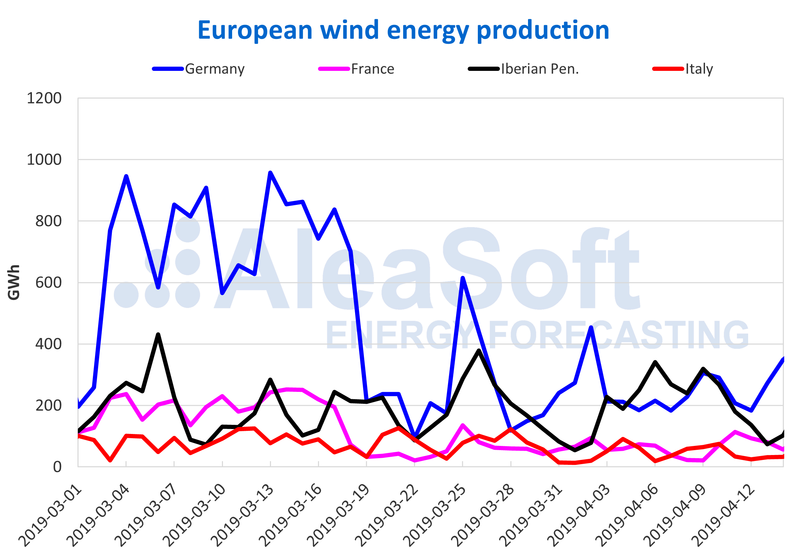 Looking ahead to the current week of April 15, wind energy production is expected to recover in most of European markets with the exception of the Iberian MIBEL market. Sources: Prepared by AleaSoft using data from ENTSOE, RTE, REN, REE and TERNA. Solar energy production, which includes both photovoltaic and solar thermal technology, had, like wind energy, an uneven behaviour. In Germany, production fell by 11% while in Spain it rose by 39% and in Italy by 1.8%. 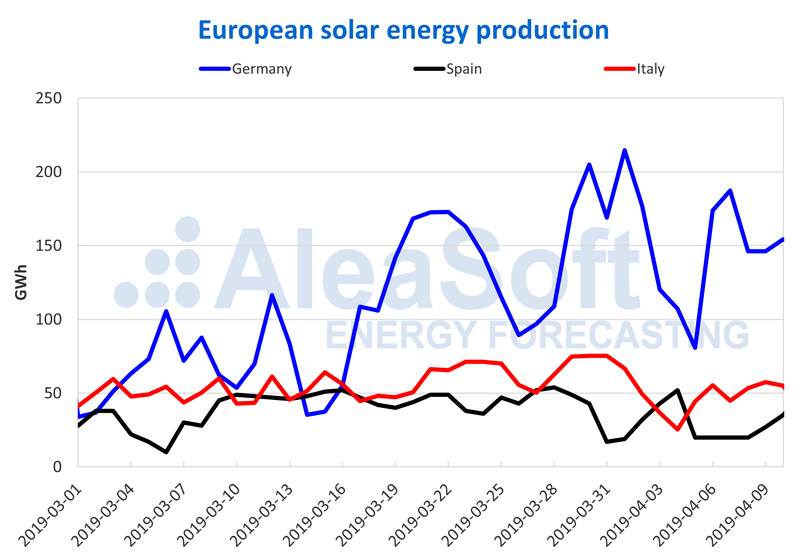 Like wind energy production, for this week of April 15, solar energy production is expected to grow in most of European markets with the exception of the Iberian MIBEL market, where weather forecasts indicate that cloudiness will increase during Easter, decreasing solar radiation available for photovoltaic and solar thermal production. Sources: Prepared by AleaSoft using data from ENTSOE, REE and TERNA.